An annual newsletter which chronicles the activities of the Cadets in Greater London, both at home and abroad. An annual newsletter which chronicles the activities of the Reserves and Cadets in Greater London, both at home and abroad. Our quarterly round up of news from London's Reserves and Cadets is available as an email newsletter. A Directory listing all Reserve Forces units in London, Royal Navy, Royal Marines, Army and Royal Air Force, together with a brief description of their roles and contact details. It also lists contact details for the Cadet Forces and gives a brief summary of the role of the Reserve Forces' and Cadets' Association. 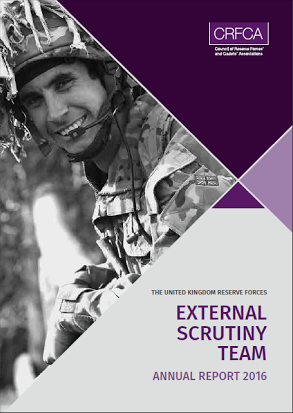 The Reserve Forces' and Cadets' Associations' statutory report to Parliament about the state of the United Kingdom's Reserve Forces. The latest news about HMS PRESIDENT, the largest unit in the Royal Naval Reserve. An employers guide to working with and supporting the Armed Forces community. The October edition of YOU London News is online now. The Reserve Forces' and Cadets' Associations statutory report to Parliament about the state of the United Kingdom's Reserve Forces. The fifth Armed Forces Covenant annual report has been presented to parliament, showing good progress on providing support for the Armed Forces Community. The Covenant is a promise from the nation ensuring that those who serve or have served in the Armed Forces, and their families, are treated fairly. The eport details the actions taken to deliver covenant commitments in 2016, with over 1300 businesses now signed up to the Covenant. Compiled by GL RFCA, Stepping Forward documents the record of the Volunteer Reserve Forces from Greater London from 1908 to the present day. It is a comprehensive and detailed reference guide to the lineages and linkages of London's Reserve Force units. A Solemn Drumhead Service of Remembrance for those who Volunteered to Serve in the First World War was held at Royal Hospital Chelsea on Saturday 28 June 2014. We produced this fascinating booklet to commemorate and celebrate TA100, the 100th anniversary of the founding of the Territorial Army in 1908. 2010 was the 150th anniversary of the Sea Cadet Corps and the Army Cadet Force. This booklet was produced to celebrate the Cadet Movement in London over the last 150 years. Provides the most comprehensive and constructive information on ex military and forces jobs available in the UK.